One of theHottest interactive game Today! Description: Ready ! Set! go! lets see who can zap as many Moles as possible in a 1 or 2 min time frame. Players are each allowed to use their hand or our hammer to hit the lights as they light up, the player that hits the most lights wins. The zap a mole game comes with a hammer for each player . Like the rest of our inflatables, adult supervision is required at all times. 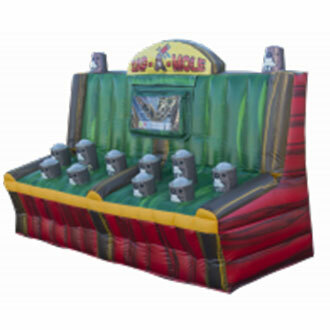 call or email us for more info in this new zap a mole game, we're one of the first companies in the area that have this new zap a mole inflatable game.